I can't remember if I did this last year or not (I don't think I did), but this year I've decided that, in the face of just over three weeks to Christmas, and a lot of gift knitting that must be done, thereby obliterating any other potential blog fodder, I am going to do the FO posts as the Os are Fd (so to speak). Otherwise I'll be forced to post a picture of my narrow escape from Sleeve Island and that will stay at the top of the blog for the next few weeks. And that's not what any of you want to see - grey cables are not very interesting photo montage material. So without further ado...Present #1 (that I'm blogging about in December - some of the others have already been mentioned and won't be revisited). Yarn: For the outer mitts - handspun pencil roving from Artisan Threads, in natural white and naturally dyed teal, approximately 135 yds teal and 80 yds white. Also some handspun brown BFL for the cuffs, left over from the Norwegian Snail Mitten extravaganza last year - no idea how many yards. For the lining - 120 yds of handspun BFL singles that were dyed by me with Burgundy Jacquard Acid dye. 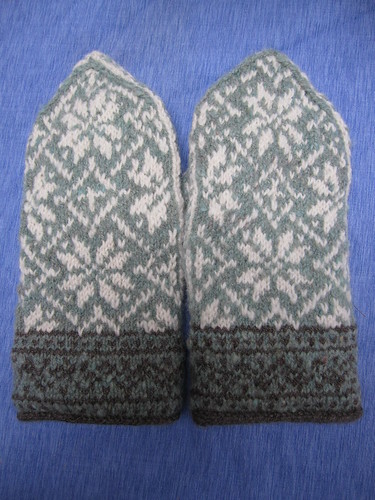 Needles: US 4/3.5 mm for outer mitten, US 5/3.75 mm for lining. 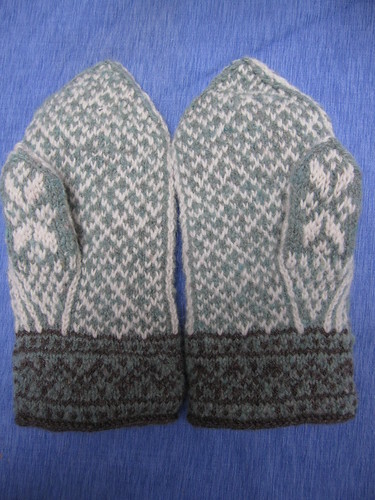 Gauge: Outer mitten: 6 sts/inch, lining: 5 sts/inch. Start/finish: 28 October - 29 November 2010. They would have been done faster, but I had a wait of about a week and a half while I tried to get some more teal pencil roving, and then I had to spin and dye the lining yarn. Comments/mods: Let's start with modifications: besides using handspun instead of commercial yarn, absolutely none. This pattern was a joy from start to finish - well written, nicely laid out, with gorgeous pictures and fantastic charts. I like the purled cuff quite a lot - using two strands of yarn for alternate purl stitches creates an interesting texture. 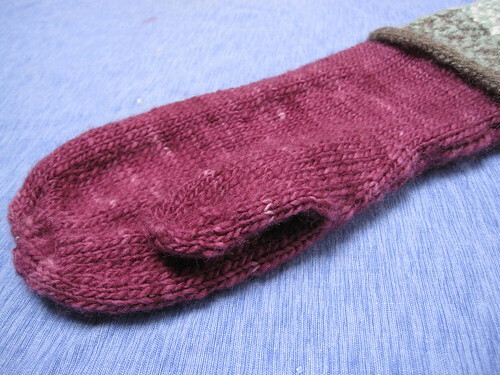 The pencil roving had a bit of lanolin left in it, and the rustic yarn made for a slightly scratchy outer mitten, but the lining solved the itch factor. And Gill at Artisan Threads was very helpful in procuring me another ball of the teal roving when I ran out (I may have even gotten some more of the white roving too. Just to have on hand, you know). I really like the lines and patterning on the thumb gusset. 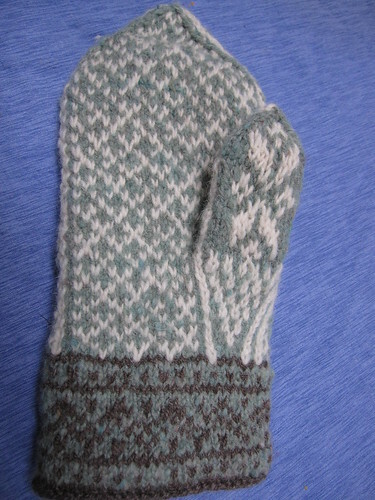 I even managed to remember to switch charts for the left and right mitten, so the amount of swearing involved in the completion of this project was greatly reduced. 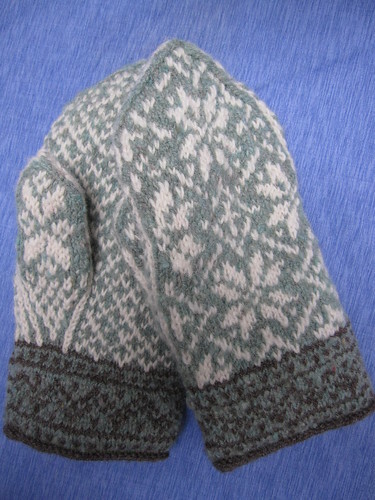 For the lining, I spun a singles yarn because I thought that some feltability might be a good thing for mitten lining. And the Spintelligence Fibre Club has me in a singles spinning mode these days. This yarn was spun at 6.25:1 and soaked in hot water until it cooled (overnight). It then went in the dye crockpot with a 2 DOS burgundy dye solution (volume dye/weight of fiber) for a couple of hours. I let that cool overnight, and the dye bath was largely exhausted the next morning. 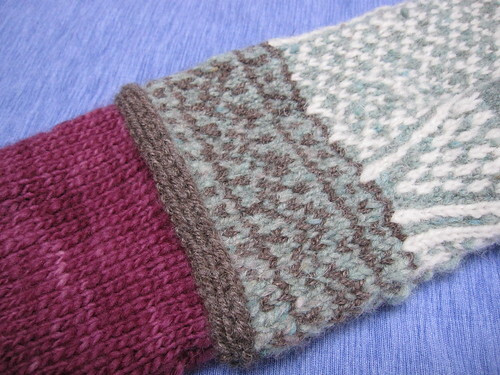 Written by porpoise On December 1, 2010 In "Christmas 2010", "FO", "handspun", "handwear", "mittens"